With the increase in claim volume, York has asked us to remind all adjusters the importance of utilizing the York First Inspection Call In Line. This is a billable item which should be documented in the FileTrac notes and time log. Our file managers and administrative staff will be looking for this on all assignments from York. 1. Determine vacancy and photograph the thermostat on condo claims (most policies have vacancy provisions that directly affect frozen pipe coverage). 2. Subrogation - All claims, whether caused by weather or not, have the potential for subrogation. Be sure to look for any recent work, improper installation of plumbing lines and any other contributing factors which may have led to the loss. 3. Salvage - With the rise in price of copper and other metals, don't forget to document any significant removal that can be reported as possible salvage. Got any good winter claim tips? Leave your comments below. The commercial property survey is a document provided by York that they have asked to have filled out on all property losses. This document is divided into two parts, the first of which must be completed with the insured and the second during your inspection. Click the link above to download the CPS and print a few to keep with you while working York claims. 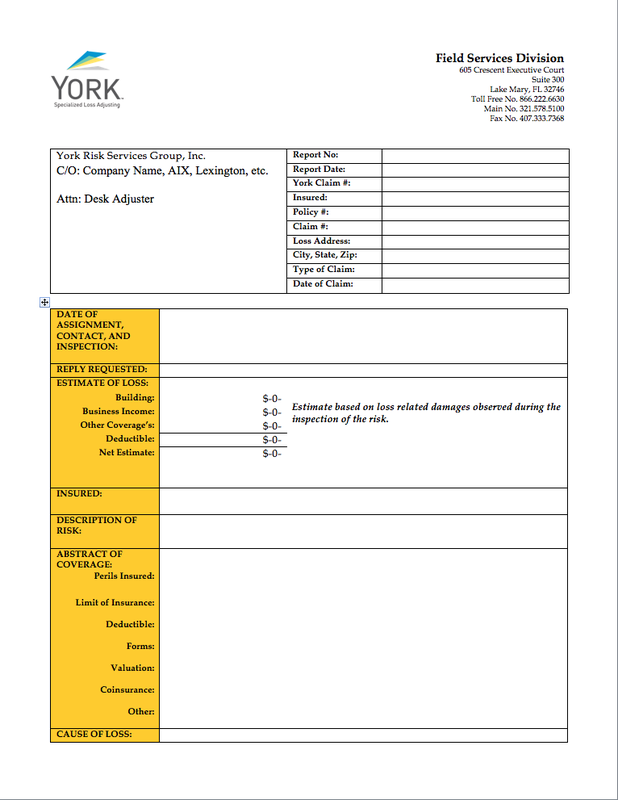 York Field Services Special Accounts now has a new report format that is to be used for all property and liability reporting. These can be found in the library. If you see York Field Services - Special Accounts under the Client/Rep Field in FileTrac you are required to use one of these forms on all reporting for that file, starting today. Currently, Christine Jennette is the only special account we are handling. If she is listed on one of your files, this report form affects you. Every claim comes with a maximum cap on Mileage & Drive Time. This maximum cap for mileage is 150 miles round trip. Additional mileage and drive time must be Pre-approved by York. When I contact you concerning an assignment, I will let you know if any additional mileage/drive time is approved. When the claim is set up in File Trac, the notes will also state the max mileage/drive time. The adjuster is NOT to discuss mileage/drive time with York. If the Desk Adjuster requests you make an additional trips to the loss location, ask them to email the request to you. Then copy/paste the DA’s email request into File Trac Notes. The max mileage / drive time still applies to any additional trips. 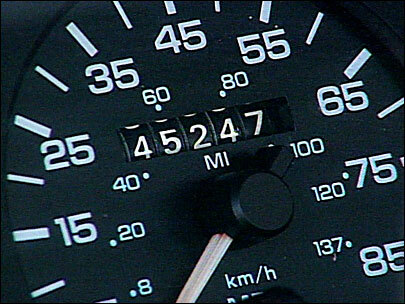 Please input the approved mileage/drive time on your T&E. It takes too much of our time having to change it. An updated Field Services Xactimate Header and Model Opening Statement is now available in the library. 1. Save the CHX on your desktop. 2. On the Control Center tab, click Services on the top menu bar, and choose "Data Transfer...". 3. Make sure the Transfer Type is set to "Folder" and Action is set to "Retrieve". 4. Click on Browse, and choose Desktop. 5. Select "Company Header" from the left list and on the right you will see the York CHX I emailed you. 7. Xactimate will import the company header so that you can select it in the Parameters portion of the project. 8. Repeat same process for MOX, except that you will choose "Model Opening Statement" rather than "Company Header" on step #5. From time to time its necessary to re-open a file to complete additional tasks, follow-up on repairs or further investigate new details. This all sounds pretty straightforward, but are you doing it right? Want to bet your check on it? Read on to learn the proper way to re-open a file and make sure you are getting paid for your efforts. Get permission to close the file in writing! The Desk Analyst may want additional tasks performed, but that doesn't mean you should start racking up extra time and mileage. After the request is made, kindly inform the DA that you will need the additional tasks confirmed in writing (email). Make sure the DA's instructions (email) make it in FileTrac and that your File Manager is alerted. See more on Adding Notes to FileTrac. Then make sure you work the file to complete the further tasks. Step 4 - Get Paid! Wait for the okay from the file manager or Quick Cat Staff to pursue the additional tasks. Guarantee: Ignoring these instructions will result in non-payment to you, your file manager and Quick Cat...it's not worth it. 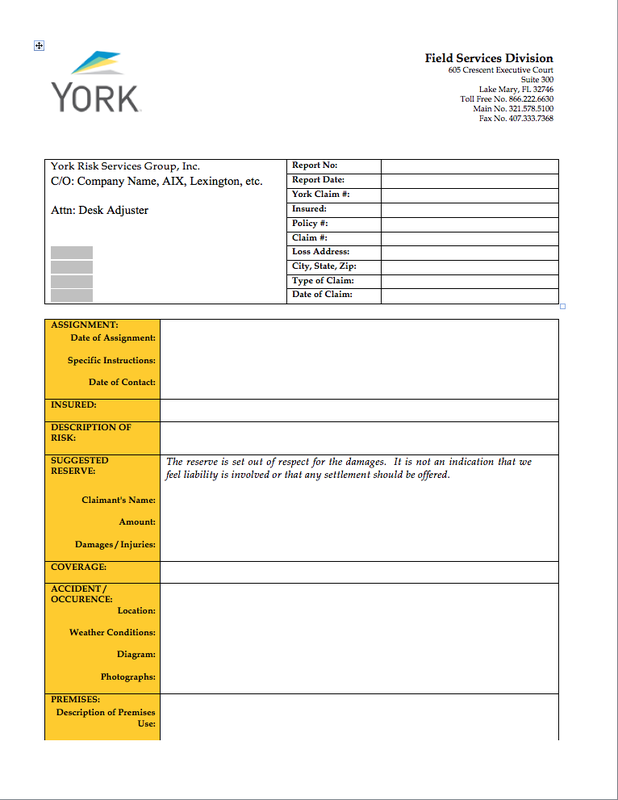 The forms below have been tweaked by York Management and are to be used on your assignments going forward. The use of the updated form is mandatory and any report not in the correct format will be rejected. In addition to the changes, all unnecessary white space must be removed and all captions must start at the top of the box (no skipped spaces). Font sizes, margins and captions are not to be altered in any way. Thank you for helping us implement these changes quickly!